Improv quilting isn’t new, I reckon it is possibly the oldest form of quilting as fabric scraps and woollen off cuts were patched together to make the earliest form of quilts. And then there’s the fabulous improv quilts of Gees Bend, Nancy Crow and Gwen Marston. But improv with intent, is that a fairly modern concept in quilting? It relates to abstract art and music where the intent to convey an idea, image or concept drives the design process. 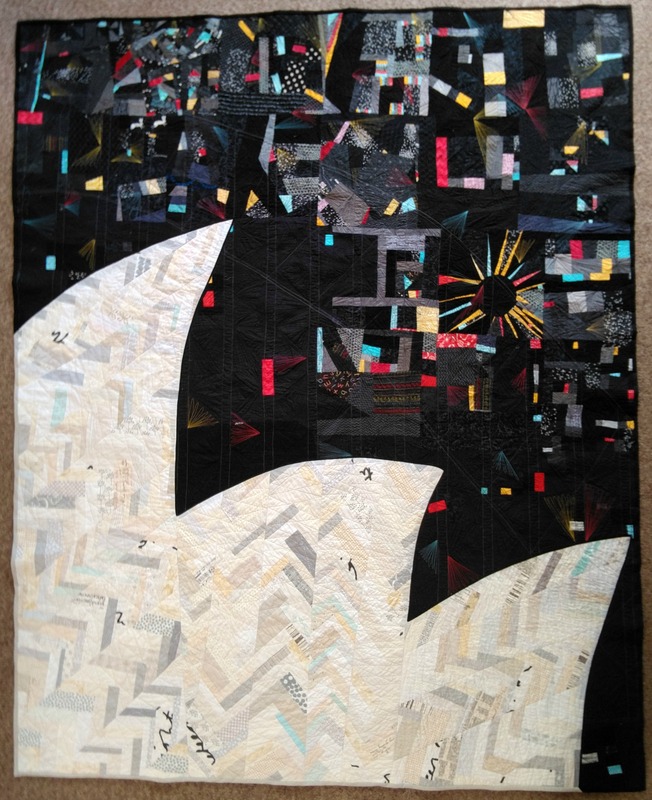 This year’s QuiltCon Charity Quilt Challenge was “to work collaboratively to create completed quilts using a predetermined color palette and improv with intent”. With that in mind we set about choosing fabrics and coming up with a design for this group project. We then brainstormed some ideas and finally settled on the iconic image of the Sydney Opera House sails and then decided that by adding the black as a sky colour and the brights as fireworks we could capture the magic of New Year’s Eve fireworks at The House. We looked at several images of the Opera House and tried to pick a minimalist composition that could be pieced. We had several sewing days where members contributed improv blocks for the night sky with sparks of fireworks and the long improv braids from the neutral tones. And then the real hard work of turning piles of blocks into a quilt top began! It wasn’t easy, group work often isn’t when there are many different approaches and ideas. At one stage it didn’t look like it would be done in time, but as is also usual in collaborative group work, a few people drive the project and get it done. Just in time! Congratulations to all the members who contributed blocks, fabric, thread and time towards this project. Extra special thanks to Kathy Thorncraft who took on the mammoth job of quilting and Catherine Butterworth for her super human effort to bind and prepare the quilt for display. 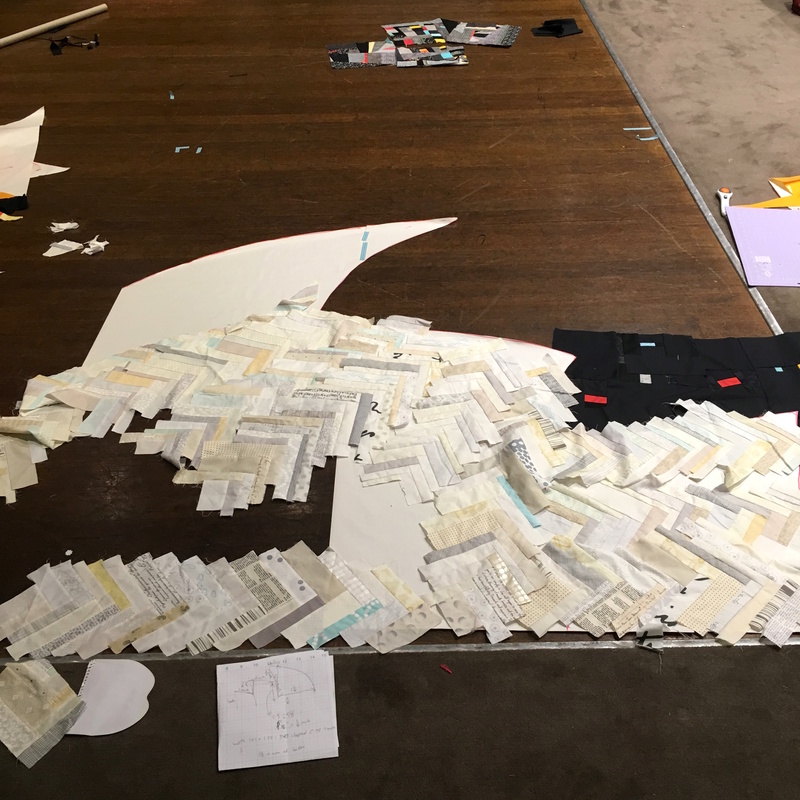 We are very proud of our efforts and look forward to seeing NYE at The House hanging at QuiltConWest, Pasadena from the 18th – 21st February along with all the other amazing MQG charity quilts! And the #quiltconcharityquilt hashtag on Instagram for further inspiring work, well done everyone!